On a challenging space game, University of Illinois researchers found that students trained on a more challenging version of a task task (switches from one task to another) developed greater gains in procedural learning and cognitive flexibility that generalized to other tasks, and yes, that their brains got bigger. The area that bigger was the striatum - bilateral caudate, and to a lesser extent, the putamen. The data are interesting for a number of reasons - brain studies in ADHD and dyslexia have suggested reduced caudate size and greater impairments in procedural learning. Games that employ motor skill and cognitive flexibility just might be able to generalize to other motor tasks like writing by hand or working with one's hands. There are also caveats of course. Dorsal striatum has also been implicated in addictive behavior and it may be that the 'adrenaline rush' of fast-paced video gaming is not so far from the truth in the dorsal striatum. But all-in-all, research like this is supportive of computer-based approaches to learning and neurorehabilitation. It is no accident that research of this sort is funded by the Office of Naval Research. Active duty personnel would benefit by training that boosts visual detection, visuomotor skills, and cognitive flexibility. 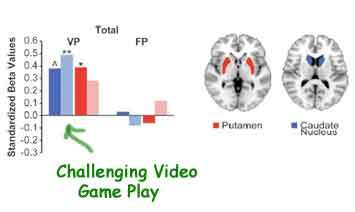 That's probably why surgeons who play video games worked more quickly and made fewer errors than surgeons who didn't. Video game play was more predictive of surgical skills than years of training or number of operations performed (that's pretty amazing).